My appt was at 8:30 and I was seen within 5 minutes. Staff very professional and Dr was very nice andanswered all my questions. My appt was at 8:30 and I was seen within 5 minutes. Staff very professional and Dr was very nice and answered all my questions. She's friggin awesome. Shes empathetic. Shes kind. Shes resourceful. I did not have health insurance and she was able tohelp fix my break outs without breaking the bank. She had amazing recommendations that worked like a charm. 5 STAR DOCTOR. She's friggin awesome. Shes empathetic. Shes kind. Shes resourceful. I did not have health insurance and she was able to help fix my break outs without breaking the bank. She hadamazing recommendations that worked like a charm. 5 STAR DOCTOR. 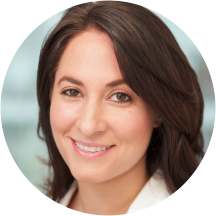 Sandra Kopp, MD is an eminent NYC board-certified dermatologist and Assistant Clinical Professor of Dermatology at Mount Sinai. She is devoted to providing compassionate, cost-effective, and comprehensive care to each individual patient by tailoring treatment regimens to fit their unique dermatologic needs. She firmly believes that patients should play an active role in their medical care and focuses on prevention and education, stressing the importance of healthy lifestyle habits to ensure overall physical and mental health. Her objective is to achieve natural appearing results and enhance self-confidence and overall quality of life. Dr. Kopp sees patients of all ages and varied cutaneous disorders, from rashes to skin cancer, as well as all cosmetic concerns. She has a unique interest in global health, specifically international dermatology, infectious disease and telemedicine. She has worked in Africa, Europe, and Central and South America. During training she received the American Academy of Dermatology International Resident’s Grant to practice dermatology in Botswana. After graduation she was chosen to participate in the “Passion to Heal” initiative with a team of leading dermatologists in Narok, Kenya. Dr Koop was knowledgeable, professional and courteous. Polite, organized , clean well run office. I went for an annual screen because skin cancer runs in my family. At my previous dermatologist, I would have a log of where all my moles where and their size at each appointment to track for growth. I have hadseveral moles removed and some of those have been pre-cancerous. Even though I explained all of this to the doctor, she did a visual scan of less than 5 minutes and then told me I was fine and to come back in one year. I was very disappointed in the lack of thoroughness and left feeling like I just wasted my annual screening. Was in and out! Dr Kopp was very polite and answered all questions I had! She was fabulous with my 5 year old! I give the highest of ratings. Staff was very pleasant, will definitely be back for all of our derm needs. Dr Kopp was great. Made me feel very comfortable and at ease while addressing my concerns. Wait time was minimal, I was in and out of the office in a half hour. I will be back for sure. the entire staff was friendly and efficient. Dr. Kopp is first rate. She is very nice, she explain you the problem you probably have.. I really like her! Great Doctor. She is thorough, friendly and answers all your questions and concerns. Wait time was under 10 mins. The office staff were also very nice. I would highly recommend Dr Kopp. Dr. Kopp has a lovely bedside manner. She is very thorough and explained everything clearly. I learned about Schweiger Dermatology Group on Saturday 9/22 at their booth on the Seaside Boardwalk during the walk-a-thon for St. Jude's. Professional & knowledgable (most criticall), plus friendly. My "only" recommendation is that Sandra (Dr Kopp) revealed to me that she wants a DOG!!! Well, we all know that a dog would make her an even better doctor! Seriously - Sandra wasvery pleasant, and personable. Yes - I DO RECOMMEND Dr Kopp. Mole removal left half of mole previously not growing hair, but began afterwards. Did not encourage me to get a gapping hole in my leg to take care of an issue. I would not EVER want unnecessary procedures, but am not so vain that I would forego necessary medical treatment. UGH. Doctor was fine but you better triple check they take your insurance--they listed that they took my insurance on ZocDoc, charged me a co-pay, and then slapped me with a huge bill! Very friendly, professional staff. I was in and out in about 30 minutes total (my appointment was at 7:30am, so that may have helped). I’ll definitely be returning and will recommend them to anyone needing a dermatologist! I've seen more than 7 dermatologists since i had started to get severe cystic acne. Dr. Kopp took her time during every appointment and seemed to care about my process and signs of improvement. I ended up getting on accutane whichi put off for some time because of the side effects but the doctor was always available even via phone if needed and adjusted the meds accordingly. It ended up being the best decision i've made because my skin never looked better. Very professional and thorough. Explained all forms and procedures. Office staff was very friendly and efficient. There was a short wait to be seen, but once taken to the exam room I was seen quickly. Dr. Kopp was very friendly and thorough, explaining things along the way. I would highly recommend this practice. Dr. Kopp has been treating me for my hormonal acne for a few months and it didn't take her long to figured out a treatment that worked for me. She recommended a few cosmetic treatment that wasn't covered by my insurancebut I didn't even need it after she was able to treatment me medically for my acne without the expensive cosmetic treatments. Love her!!! She was great. Very personable and knowledgeable. Would definitely recommend her. Dr Koop is the best always willing to spend the time to answer questions! Happy to see Schweiger's offices are fully paperless. Online intake paperwork and iPads in the examination rooms. Very efficient. Dr. Kopp was very friendly and professional. I will return! I was very pleased with the service there. She comes in to listen to your issues and gives you great advice. Upon my leaving, I got a feeling that my Skin Care is in the right hands. Thank you Dr.Sandra kopp?? Dr. Sandra was very informative and nice. The wait time was very short. Rude staff, long wait time. They never take you in on time (20-30 mins) but if your late they charge you $50. Not happy at all. Seldom have I had as positive an experience at a doctor's office as here. Would unequivocally recommend Dr Kopp and the office in general. I love Dr. Knopp. She's the best! Very professional yet still personable. Very knowledgeable and forthcoming with options to best suit your preferences. You don't get that mechanical let me hurry up so I can see another patient vibe you getfrom most doctors nowadays. She's without a doubt one of the better doctors I've had. I didnt have to wait too long! It was pretty quick! Dr. Koop was very friendly, nice and professional. She made sure she answered all of my questions and offered many suggestions as well. I would definitely reccommend her! I was very pleased with her! Dr. Kopp was extremely professional and diligent. She explained everything that she was doing very well. I would definitely recommend her to others. Great dermatology visit- front desk staff, MA and doctor were all great. Highly recommended! I am very happy and feel very optimist after my first app. Can't wait to go back ! She is professional and personable. Considerate, took ample time to answer questions, did two painless biopsies. Thank you! Doctor Sandra Kopp is located at a great area in Hoboken so my initial thought was that she was going to be a great doctor. However, I am very unhappy with her bedside manner and her uneasiness to speak to meabout the questions that I had. I felt that she was just rushing her time with me so that she can speak to other patients. Also, while she was doing a procedure she started to do things that I did not consent her to do. I feel that if a doctor is doing a procedure they should let you know what they are doing before they continue doing a procedures on you. I am totally unhappy with the treatment I received with Doctor Sandra Kopp. Not to mention afterwards, she did not checkup with me or proceed to give me instructions about a follow up appointment. I would give her one star! Save yourself the trip to the doctors and schedule to see another Dermatologist! I was a new patient and the check-in process was very fast as smooth. The staff were very pleasant and courteous. I didn't wait longer that a couple minutes before I was called into the examination room. The nurse asked acouple of routine questions and then the doctor came in quite soon after. Doctor Kopp was very nice and professional and I felt very comfortable. Was outta there in less that thirty minutes and am happy with my experience. Very professional. In 1 minute Dr Kopp diagnosed! What other doctor couldn't. Dr Sandra Kopp attentive, helpful and just amazing as a doctor.